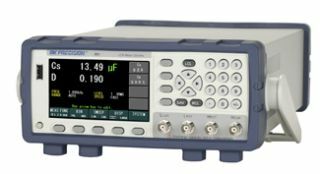 The B&K Precision model 891 300 kHz bench LCR meter is a new compact, value-priced LCR meter that measures inductance, capacitance, and resistance with 0.05 percent impedance accuracy over a fully adjustable test frequency range of 20 Hz to 300 kHz. With a 300-point linear and logarithmic sweep function, bin comparator, and versatile remote control interfaces, the 891 is suitable for characterizing components in laboratory, quality control, and small-volume production environments. On the production line, test time can be significantly reduced using multiple bin comparator sorting functions. These comparator functions allow users to set high and low limits for sorting components within their specifications. The 891 offers a nine-bin comparator sorting function that can be set up in absolute or tolerance mode with pass/fail beep. High and low limits can also be set for secondary measurement parameters (Q, D, R, G, theta, X, B) using the 891's additional secondary bin. The 891 features an intuitive interface with a menu-driven keypad and a bright, 4.3-inch color LCD, which displays both primary and secondary measurements along with all test signal parameters on one screen. The numeric keypad and cursor buttons let users quickly set test parameters. All sweep and bin sorting results can be easily displayed on a graph or table. In addition, the LCR meter provides selectable test levels of 0.5 Vrms and 1 Vrms, DC resistance measurement, and standard SCPI-compliant USB (Virtual COM), GPIB, and LAN interfaces for programming and remote control. A USB host port is available on the front panel for external storage of up to 100 instrument setups including 1,000 measurements and screenshots. For four-wire measurements, standard Kelvin clips are included with the instrument. An optional test fixture (model TL89F1) accessory is offered for convenient measurement of axial and radial lead type components.